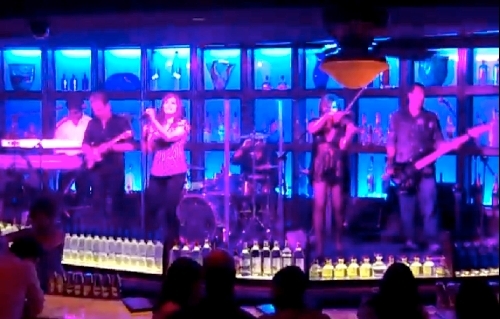 When local cover band Odyssey performs, you won’t know what to expect. But if you let the band know what you like, expect to enjoy yourself. The band members play a wide variety of music. Their website claims the only thing they don’t play is polka or death metal, but to hear La Fond talk about it, chances are they’d give it a shot if it came right down to it. It’s not that those two songs aren’t enjoyable for La Fond to perform, it’s that she feels generally that audiences have had their fill of them, and she and the band don’t want to bore anyone, not when there are new songs to explore. The band plays music from at least the last seven decades, including the standard “I’ll be Around” that first hit the airwaves in the ’40s, and hits by Lady Gaga and the Charlie Daniels Band. La Fond not only sings in the band, she’s also the band manager and books the gigs. Recently she has started billing her name to the front of the band, something she feels she probably should have done from the beginning. La Fond has been a performer for a while now, but a few years ago she stepped away from the microphone for two years. When she came back she felt it was time to form her own band. She knew whom she wanted to work with and who was available. Although La Fond said that some of the positions have been transitional, she feels blessed to have good people working with her. The band has a busy October scheduled, and from there La Fond hopes things keep getting bigger and better. The only obstacle she sees is the shrinking of venues for lounge performers. La Fond bemoans the loss of several lounges on the Strip. Christine La Fond and Odyssey are scheduled to perform at 7 p.m. Wednesday, Thursday and Sunday, 10:30 p.m. Friday and 8 p.m. Saturday at Marilyn’s Lounge in the Eastside Cannery, 5255 Boulder Highway. The lounge is for adults 21 or older. Admission is free. For more information about the band, visit odysseytheband.com. Contact Sunrise/Whitney View reporter F. Andrew Taylor at ataylor@viewnews.com or 380-4532.